L'Anse aux Meadows mean Jellyfish Cove in French and contains the most significant archaeological site in North America that is located on the northernmost edge of the island of Newfoundland that had been discovered in 1960 as the only known site of a Norse village in Canada and North America, outside of Greenland. This site is the only widely accepted settlement of pre-Columbian trans-oceanic contact that happened in North America and is famous for its possible link with the attempted colony of Vinland that had been established by Leif Ericson during the year 1000, or when the Vikings explored the Americas. These important remains would be discovered in 1960 by the Norwegian explorer, Helge Ingstad, and archaeologists have concluded that the site if of Norse origin since there are many similarities between the characteristics and relics uncovered there and at sites discovered in Greenland and Iceland from about 1000 AD. The meadows is the only known site of Norsemen found in the continent outside of Greenland and represents the farthest known extent of European exploration and settlement of the new world before the voyages of Columbus some half a millennia later, and in 1978, would be named a World Heritage Site by UNESCO. The archaeological excavations would be conducted by an international team in the 1960s, led by archaeologist, Anne Stine Ingstad, Helge's wife, under the direction of Parks Canada and each time the excavations would be completed in a perspective area, it would be then reburied to protect and conserve the cultural resources that remained. This site would be dated to about 1000 years after Christ appeared, which seems to corroborate the dating of relics discovered and the kinds of structures found. The group discovered eight buildings that they believe were merely sod houses, or sod laid over wooden frames, and eventually identified as either dwellings or workshops, the biggest being 94 by 51 feet and housing numerous rooms. The workshops would be identified as an iron smithy that housed a forge and iron slag, a specialized boat repair area that had worn rivets, a carpentry workshop filled with wooden debris, with many miscellaneous items like a whetstone, stone oil lamp, bone knitting needle, bronze fastening pin and part of a spindle. Since those relics, like spindle and needle were found, the archaeologists believe that women had been included in the trip. Norse sagas are written words of older oral traditions, with two such special Icelandic sagas called the Saga of the Greenlanders and the Saga of Eric the Red, were two such written oral stories about the experiences of Norse Greenlanders that discovered and tried to settle lands that lay west of Greenland, which they would describe as Vinland. Budget Rent-A-Car is one of the best rental car businesses in the industry. Budget has the best printable coupons in the business that will give you GREAT deals and the lowest prices today. Gander Apt. Budget Car Rentals - 1000 James Blvd. 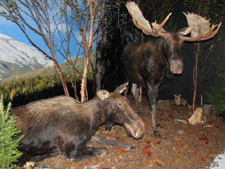 This wildlife museum contains more than one hundred full-size Newfoundland animals in such realistic scenes that you won't believe that they are just taxidermied creatures, but will provide you with excellent ideas and lessons about how these animals survived in their environment. These exciting dioramas bring the reality of life around animals right up close and personal, where you can study, touch, feel and learn more about these magnificent creatures that live in this region of the world. Even the smells associated with the animals and tundra seem to waft out from these scenes and permeate your senses, bringing you much closer to nature than you thought would happen. Full-sized critters include; martens, moose, fish, polar bear, beavers, caribou, coyote, seabirds, puffins, lynx, black bears, and more. The museum's scenes seem to include just about every type of setting that you could run into with these animals, from the mountaintops to the sea shores, with forests, valleys, bogs and beaches. The museum has an excellent gift shop located there as well, after having a grand opening in 2009, with thousands of enthusiastic and happy visitors coming here to learn more and experience more than they normally would by walking, hiking or meandering around the woods of Newfoundland. The gift shop has seal-skin & fur products, unique clothing items, antler & bone carvings, photography, antler chandeliers, fireworks, books, taxidermy items, souvenirs, knitwear, fishing supplies, and camping and hiking supplies. HUGE savings are waiting at Enterprise Rent-A-Car for your next vacation or trip. Enterprise will give you the best selection of new quality cars to choose from and the best staff to help you with that decision. Enterprise Savings will give you the BEST deals in America today and offer OUTSTANDING deals. 1 Apt. Rd. Deer Lake Apt. Enterprise Car Rental St. John's Apt. Corner Brook Enterprise Rental Car - 119 O'Connell Dr.
Entrees; include tossed salad, dinner roll, starch & veggie; Michael's marvelous veal marsala with fresh mushrooms, marsala wine & herbs top hand cut veal; Jessica's baby back ribs basted in spicy BBQ sauce; Delmonico steak is western grade A beef, hand cut to order, char grilled your way; NY strip steak is grade A beef, hand cut to order, char grilled your way; chicken marsala with fresh mushrooms, marsala wine, herbs top twin breasts of chicken; southern fried chicken is deep fried golden brown, served with FF & slaw or salad; prime rib of beef with natural au jus & fresh horseradish; lemon pepper swordfish brushed with lemon butter & herbs then charcoal grilled; sea scallops is fresh from N. Atlantic sea, broiled with touch of white wine, lemon & creamy butter; crab cakes; fried shrimp lightly breaded, deep fried with FF, slaw or salad; English pub battered haddock is 10oz. haddock fillet deep fried with tartar sauce. RentalCarMomma.com and Hertz Rental Cars have teamed up to give their customers the BIGGEST discounts in the rental car business. Hertz discounts will SAVE you more money than any other business. Hertz Rental Cars St. John's Intl. Apt. 80 Airport Terminal Access Rd. St. John's Hertz Car Rental - 131 Duckworth St. This basilica is the metropolitan cathedral of the Roman Catholic Archdiocese of St. John's Newfoundland, Canada, the mother church and symbol of Roman Catholicism in the country, as well as the biggest construction project and structure found in the province, that started in 1839 and finished in 1855, one of the biggest churches in North America at the time it was completed. It sits on the highest ridge of the city, overlooking the city of St. John's, and faces the narrows that form the entrance to the harbor, constructed in the shape of a Latin cross, in the Lombard Romanesque style of a Roman basilica. The church has many outstanding architectural features that showcase the talents and ingenuity of earlier craftsmen, that used tools by hand, and usually made by hand. It is constructed of grey limestone and white granite that had been quarried in Dublin and Galway, Ireland, with grey sandstone coming from St. John's and Kelly's Island, Conception Bay, Newfoundland. The exterior is 260 feet long and 22o feet wide, with two rising towers and room for some 2500 congregationists. The Altar of Sacrifice, standing at the front to greet you, contains one of the most revered and priceless statuary works in the basilica, called the "Dead Christ", which is a sculpted Carrara marble created by famed Irish sculptor, John Hogan in 1854. It also showcases works by Irish sculptor, John Edward Carew, while the east bell tower houses nine bells that include the biggest, called the St. John bell, that weighs two tons and was bought in 1850, struck by James Murphy of Dublin, that had been the biggest bell ever cast in that country up to that time. 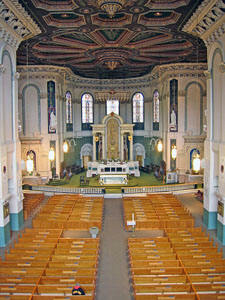 The basilica has 28 beautiful stained glass windows that adorn the upper walls and were created by French, English and Irish craftsmen that date to the 1850s and 1870s, with a magnificent pipe organ from world famous Casavant Freres of Quebec, as a memorial to parishioners that died in WWI and WWII. It is the biggest in the province, with 66 stops and 4050 pipes. On your next visit to Newfoundland, Avis Rental Cars will make your visit the best. Renting a car at Avis is easy and hassle free. Avis Rental Cars will help you choose the best vehicle for your trip and our friendly staff will help. Avis Rental Cars has printable coupons that were designed to SAVE you money on each transaction. Deer Lake Apt. Avis Car Rental - 1 Apt. Rd. Avis Car Rental Gander Intl. Apt. - 1000 James Blvd. 80 Apt. Terminal Access Rd. 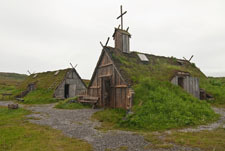 Norstead, the Newfoundland Viking village and port of trade has been meticulously reconstructed to represent the original Viking settlement that began more than one thousand years ago, and has become a central attraction in the province. It won the provincial Attractions Canada award for the Best New Attraction in 2000, and became the centerpiece of an array of events that led to the year's culmination of the 1000th anniversary of the Vikings arrival in the new world. One outstanding exhibit is the replicated 54 foot Viking knarr that had sailed from Greenland to L'Anse in 1998 with a nine man crew. The village has become a real life experience with costumed interpreters helping visitors to understand more and learn more about the people, the culture and the original settlement that began the colonization of the New World. Join others in the Chieftain's Hall where stories and legends about Vikings and their travels are told, or wander over to the blacksmithing iron forge to learn more about the methods used to create weapons, tools and other items that became popular with folks. There is a boat shed where the knarr is docked, along with other magnificent examples of early Viking ships and vessels. Exhibits include a runes teller, accommodations and restaurants, Viking Nalbinding knitting, candle making, the Snorri Viking ship, animals housed at the village, the artisans marketplace and more, where you can learn how these hardy folks lived in the new lands that awaited them, and the opportunities that lay ahead. The village has many excellent educational programs, a photo gallery and tour group information, along with many other exciting and interesting novelties that will thrill you and give you and your family one of the best adventures of the year. Thrifty Car Rental has been a staple in the car rental business for many years. Thrifty Rental Car will give you the BIGGEST discounts in the industry. Thrifty Discounts will change the way you do business with car rental companies today. Deer Lake Apt. Thrifty Rental Cars - 1 Apt. Rd. The Grenfell House museum is about the well known medical missionary and philanthropist, Sir Wilfred Grenfell, and his fiancé, Anne Elizabeth MacClanahan, that arrived in Newfoundland in 1892, and began designing this marvelous house, using local carpenters to construct it from 1909 to 1910. Grenfell came to the island as part of a National Mission to Deep Sea Fishermen, to investigate their living conditions that were happening at the Labrador fishery. The shocking state of poverty that these fishermen and their families endured was appalling to the team, and Grenfell would come back the next year with two more doctors and two nurses; thus starting a lifetime of service to the inhabitants of Newfoundland and Labrador, who would eventually gain help from the local governments, and establish the first hospital on the Labrador coast of Battle Harbor. He would return each summer to alleviate the state of these folks' health, and began to consider that much of their problems brought to light their dependence on the local merchants. In 1893, he would help them organize a fishermen's coop at Red Bay, and by 1909, there were eight such coops in operation. Grenfell would continue to return and help the fishermen and their families with anything that would improve their living conditions. He would be knighted in 1927 for his outstanding work, and in 1938, his wife passed on and within two years, he would join her. Their house is now the property of the historical society that was formed to honor his excellent work, and in 1986, the house would be made a Registered Heritage Structure by the Heritage Foundation of Newfoundland and Labrador. Dollar Rent-A-Car has the most cheap locations in the world. You know that you will get the best deal on a new quality vehicle when you use a company that has a name like Dollar. Dollar Cheap Locations will GIVE you the best deals in the nation today. Deer Lake Dollar Car Rental - 1 Apt. Rd. Dollar Rental Car St. John Intl. Apt. The art gallery is now known as the Rooms Provincial Art Gallery, and has become the premier public gallery in the province devoted to developing and displaying contemporary art that opened in 2005, offering about 15 exhibitions each year. These outstanding exhibits range from new-media installations to renaissance paintings and printmaking. It provides excellent new works from around the nation and world, although a special emphasis is given to the local artists. It had been known as the Art Gallery of Newfoundland and Labrador (AGNL) and sits in the St. John's Arts and Culture Center. The center incorporates the best of the country's culture, history and artistic expression, after having combined the provincial archives, museum and arts gallery. Rising above the skyline in St. John's, the Rooms enhances the 21st century technology with a unique visual look into the past, with outstanding rooms, that reflect the city's earlier examples of fishing rooms, where the families would come together to process their latest catch, where today, they will gather to explore collections, programs, exhibits and stories that interpret the natural world, through its art, relics, architecture, archaeology and archival records. The site originally had held the old Fort Townshend, a star shaped citadel that had been one of the biggest British forts in the new world during that period. Their permanent collection includes more than 4000 works of art that include works by such artists as Jim Hansen, Anne Meredith Barry, Peter Bell, Cecil Day, Christine Koch, Mary Pratt, Rae Perlin, Jean Claude Roy, Janice Udell and many others. National Car Rentals will get you on the road quickly and without any hassles. National Car Rental offers its customers the BIGGEST savings online and around the nation. Gander Intl. Apt. National Car Rental - Gander Apt.